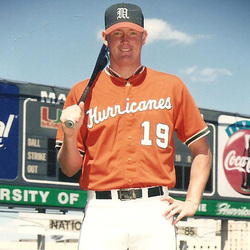 Aubrey Huff was one of Coach Jim Morris' most powerful hitters during the school's NCAA record run of College World Series trips. Born in Marion, Ohio, he grew up near Fort Worth, Texas and attended Brewer High School where he was an all-district baseball player and also excelled in basketball. He came to UM in 1997 from Vernon (Tx.) Junior College, where he was named team MVP after batting .410 with 17 home runs and 61 rbi's in 1996. After his arrival in Coral Gables, he teamed with UM Hall of Fame member Pat Burrell to produce 2 of the most offensive packed teams in school history. During Aubrey's 2 seasons, the Hurricanes rolled to a 102-30 record and in 1998, the team set school records for home runs, rbi's, slugging percentage and total bases and averaged 10 runs per game. That year was also Aubrey's best, as he led the team with 21 home runs and a school record 95 runs batted in ! At the end of the year, he was rewarded for his efforts and garnered first team All-American honors from Baseball America, The Sporting News and the National Collegiate Baseball Writer's Association (NCBWA). For his UM career, his .400 batting average is 2nd all-time, and he is 3rd with a .719 slugging percentage. He is tied for 3 individual game records: most runs, 5 (3/28/97 vs. Harvard); most doubles, 4 (5/16/97 vs. Ga. Tech); and most home runs in an inning, 2 (5/21/98 vs. Bowling Green), which occurred in the opening round of the Atlantic Regional and included a Grand Slam ! His 1998 stats include his .768 slugging percentage (2nd highest in school history, 200+ at-bats), .412 batting average (4th highest, 200+ab's), 179 total bases (4th highest) and his 21 home runs is 5th highest all time. Aubrey was selected in the 5th round of the 1998 MLB draft by the Tampa Bay Rays and made his major league debut on August 2, 2000. In 2009, he began his 10th season in the big leagues with the Baltimore Orioles, before being traded mid-season to the Detroit Tigers. In 2008, he enjoyed one of his best seasons, being named the Orioles team MVP and receiving league wide honors as the winner of the Silver Slugger Award for desiganted hitters and the Edgar Martinez Award for the Best designated hitter in the American League.